Academics, Education, and Accountability ~ A PRIORITY. and Cultural Responsibility ~ ESSENTIAL. adults with opportunities to grow and develop social awareness and leadership skills. 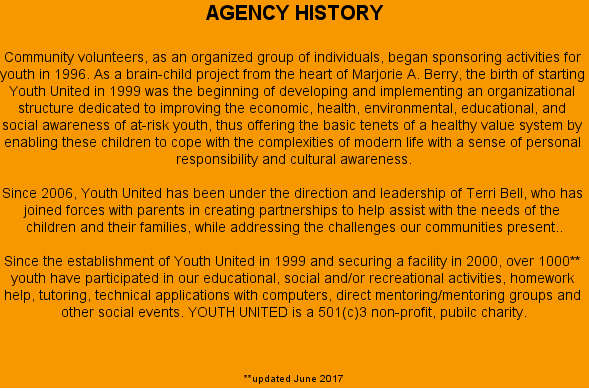 involved in, while offering cultural, technological, recreational, and social activities. adding areas of interests to educate, motivate, and challenge minds. other youth-related events during the weekday and on weekends. the importance of academic achievement and preparation for high school success. We encourage, assist, nurture, and facilitate. of society and our changing world. most of all, SUPPORT them in a positive environment. in all subjects and grades. is offered 1 day per week. to prevent school dropout, teen pregnancy, and delinquency. Language, The Power of Words, and Appearance. to the demands and pressures of society. AND COMMIT TO EDUCATION AND EXCELLENCE. role-playing, reflective activities, and community events.